are all American made and are designed to be long-lasting and comfortable. Consider a pair of soft leather moccasin slippers, moccasin shoes or boots. lasting wear and the ultimate in comfort. hand made from all USA leathers. What Makes Footskins'® Footwear Special? Made In America: Our moccasins and leather boots are 100% made in the USA. 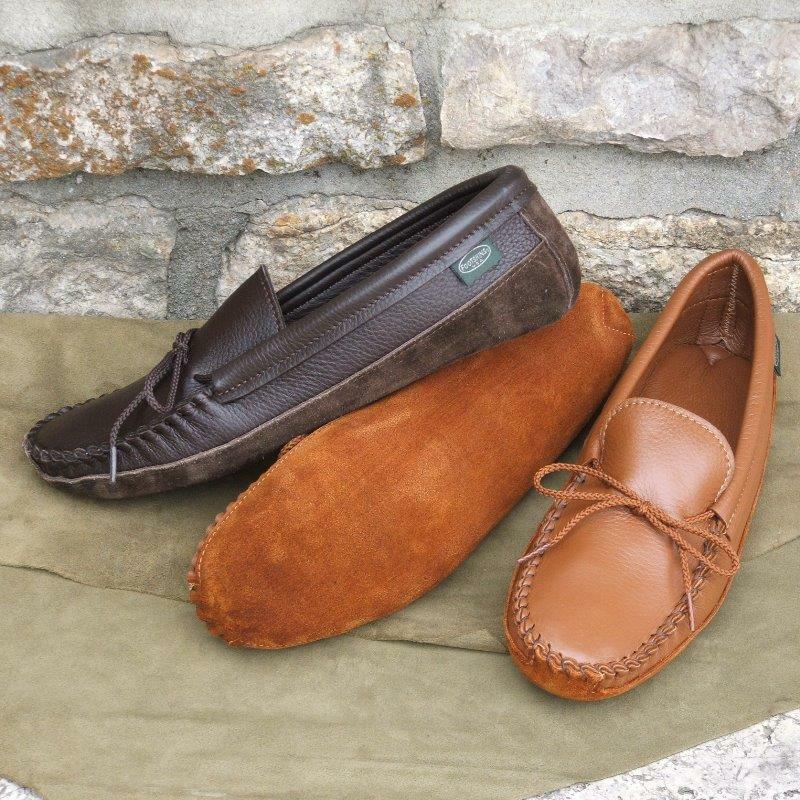 Each pair of moccasins or boots is hand crafted using only genuine American deerskin, deertan leather or cowhide leather. Genuine Leather Products: Hand made moccasins are made of high grade deerskin leather, deertan leather or cowhide leather. The moccasins have hand-laced toes, and soles that are both glued and stitched by hand, for long-lasting quality. Handmade Quality: Being handmade rather than mass-produced, each pair of leather moccasins is carefully crafted with much attention given to detail. The result is a moccasin product with guaranteed high quality workmanship and craftsmanship that you can count on. Our deerskin, deertan and cowhide leather moccasin product line includes moccasin shoes and moccasin slippers, plus Teepee Boots, ankle high, chukka-style moccasin boots, and knee high moccasin boots. Email from a Virginia customer: "First we want to thank you for the AMERICAN MADE SHOES. It is so hard now to find anything made here in the UNITED STATES. The shoes fit so nice and feel good. . .You will continue to get our business and I will definitely tell all of my family. Thank you again. God bless the USA. "